"A great smaller 5k "
I signed up last minute, about 10 minutes before the race started for this one. Last minute price was 30.00. It was based at a restaurant on Grand Island NY (Say Chesse Pizza). Since I got there so late I didn’t get to experience too much prerace atmosphere. It was cold and rainy and many people were crammed in the restaurant. Which was dry and warm. The volunteers were super nice. Offering to hold onto my swag bag til after but I decided to run to car and put in there. For a 5k last minute signup the swag was great. A nice tech T-shirt, a purple ribbon sugar cookie, granola bar, chapstick and hand sanitizer. More than I’ve gotten for half marathons. Who doesn’t love free goodies. This was a smaller 5k. Looking at results it had 170 complete it. There were many many volunteers throughout, one water station. I didn’t notice a medic station but possible there was one. They even had a photographer on the course and taking pics after. She was a volunteer and must’ve been freezing in the rain. So thank you!! After the race they had pizza and hot dogs and some fruit. You also got a ticket for free beer after. I hung around after because I saw results and realized I got 3rd in my age group so I wanted to get my medal! Yay! The restaurant was very crowded. Great race overall despite the weather. I’d do it again. "Superhero 5k- an unexpected emotional run"
My family and I planned a last minute getaway to Sarasota to get away from the cold Buffalo weather. Before leaving I googled local races just because hey you never know. And I saw there was a 5k less than a mile from our hotel. 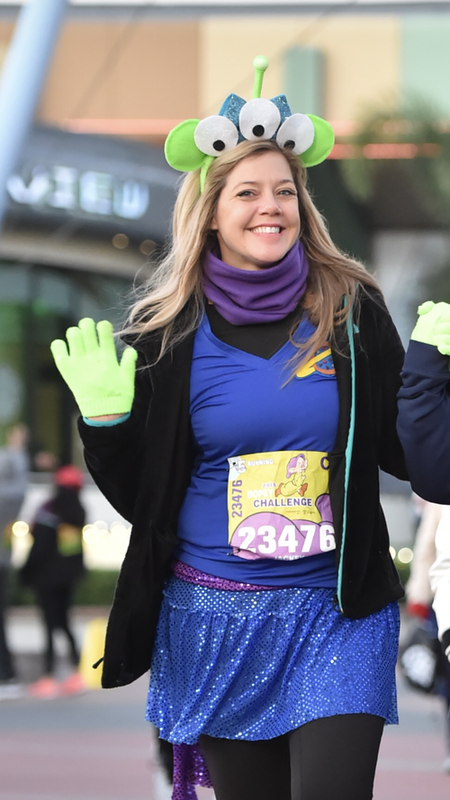 I also saw the theme for this race was super hero so I went to my costume bin and pulled out one of my favorite race costumes, Ms Marvel. The morning of race I woke up early and since we planned to hang at hotel that day and my teenage boys were sleeping I decided to go. The race takes place along Benderson Park which appeared to be a big lake meant for rowing. Initially I went to the wrong end of the lake where a rowing meet was taking place and must’ve looked silly in my costume but then I checked the fb page and realized I was in the wrong place. Luckily my husband was with me and we quickly rushed to the right spot. I was hoping I wasn’t too late to register. It was around 8:25 and race started at 9. I was the last person they let register. My husband left to go back to hotel and I waited for race to begin. They had several tents lined up from different local companies giving out freebies and a local school band playing. They had a fun 1mile/kids run that was taking place before the 5k. So let me get to the emotional part. This race was meant to help kids in foster care in the Sarasota area. When I registered they gave me a card with a child’s name. 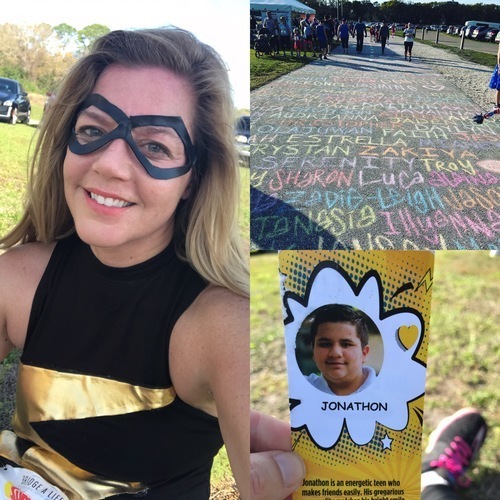 They told me I would be running for Jonathan, there was a photo and a little bio about him. As a mom to 3 young boys this touched me. And I thought about Jonathan a bit thought the race. Also they had written in chalk hundreds of names of each child written on the pavement. And along the course they had signs that really spoke to my heart. An example “Superman was adopted”. It was a bit odd being at a race where I knew absolutely nobody. And it seems like Sarasota had a tight knit running community. Lots of people knew eachother. The course was an out and back. Not my favorite type typically but I didn’t mind being that I have never been here and it was nice to know when I was halfway done at the turnaround. It was also quite warm out. I’m not sure to it. They had a water stop at mile 1 and again when you came back at mile 2. At the finish they had water. I think there was some food at tents but I didn’t stand in line to wait. I did go to registration tent after race to see if they happen to have extra shirts and they did and I was happy because it was a super soft Bella Cotton T-shirt. As for awards I thought it was great the top 6 in each age group won a medal or ribbon. I came in 13 in my age group. No medal or ribbon for me. They also had costume contest but I didn’t wait for it. I thought the awards would take a while and I wanted to get back to hotel and the family. My husband came to pick me up after race and had no problem finding parking or finding me. I would recommend this 5k because it’s really a wonderful cause. Everything seemed smooth and I’m so happy I did it! 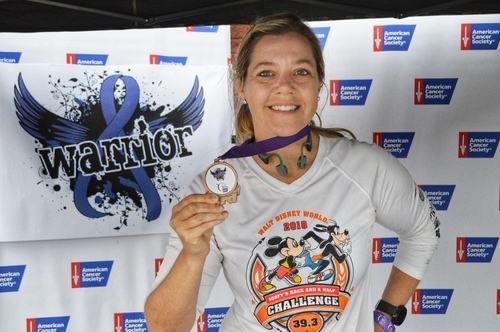 "My 3rd year doing this race and it didn’t disappoint "
This was my 3rd year doing this race and I plan to continue this tradition year after year. Our whole family drove down from Buffalo to Cleveland. We spent the night at the doubletree Lakeside. Our friend that lives in Cleveland picked up our packets ahead and brought to hotel. I did have a friend that picked her packet up race morning and she had no issues. We arrived race morning to find some of the most amazing race costumes. 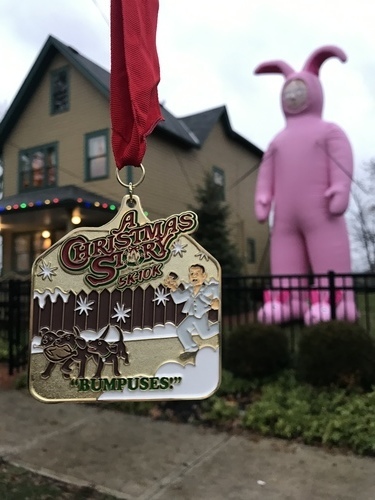 The theme this year was the Bumpus Hounds so dogs were welcome to run and even earn their own medals. I’m not really a dog person I’ll admit but loved seeing all the dogs. They were so cute. It really added to the fun vibe. My mom and son ran the 5k for the first time. I did the 10k. There was one water stop for the 5k and 2 for the 10k. The views on this race are so beautiful. I love running by the big Cleveland sign. The medals are so beautiful. Up to par with a Disney run. The entertainment prerace was exciting and I love they have the movie playing on a huge screen at the finish. The huge inflatable pink bunny was a great touch! The swag included a long sleeve cotton shirt. Tech would be nice but I’m happy with this one. Also we got a drawstring Christmas Story Run bag. Inside was a small bottle of hand sanitizer, chapstick and a light bulb. Also included is free admission to the Christmas Story House. That’s a 15.00 value. This really is a lot of bang for your buck. I recommend touring the house later on in the day when not as crowded. And only issue I heard was the busses back from the 5k seemed to be running slow or not enough. Last year that didn’t seem to be an issue. Friends and family ended up taking an uber because they didn’t want to wait in the cold. Running the 10k that wasn’t an issue for me.